You are here: Home › FSF Appeals › 2011 › Part 4: Brett Smith wants to do more for you! Part 4: Brett Smith wants to do more for you! We have raised $228,907 for free software. Help us raise another $71,093 to reach our goal of $300,000 before January 31st! ← Read previous appeals — Become an associate member for just $120 or $10/month at my.fsf.org/. The GNU General Public License (GPL) is one of the main tools the FSF provides to help protect computer user freedom. Every programmer can use the GPL as the license for software they write. When they do, they guarantee all the software's users permission to use, share, and change the program as they see fit. "This isn't Unix — I know this." 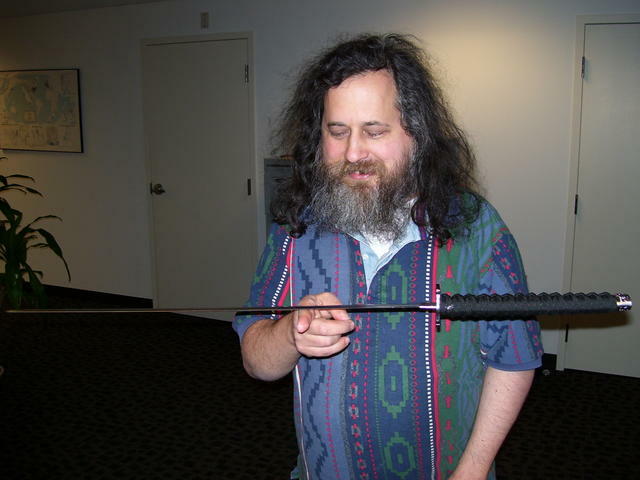 I must confess, when I first saw in our office archives the katana someone sent as a gift to Stallman after reading that comic, I didn't think much of it. But over time, I saw some oddities in and around the office that made me start to think there might be something more to it. For example, I noticed that GPL violation reports (about people distributing GPL software but claiming users don't have the rights guaranteed to them) submitted to us over the past few years, some about rather large corporations, have quietly been resolved. For reasons unknown to me, corporations would simply fix the issues and start following the GPL, without anything coming into the public light. This alone isn't anything that should seem unusual. After all, Brett Smith has been the FSF's license compliance engineer for several years now. Surely he's just a regular guy from Kentucky, experienced at his job, and not some sort of secret agent. Right? It took me a while to figure it out, but once I examined the evidence in front of me, I realized it was the only logical conclusion. The first hint is the sheer volume of Brett's output. This past year alone, he answered hundreds of complex licensing questions from the public, wrote some widely read and timely posts for the FSF's blogs, coded up Python scripts during breaks, and dashed across the country to give input to policy makers. Despite the pressure he worked under, he managed to do it all in a timely fashion and with the kind of poise that makes you think, "I bet this kid is cool enough to beat a lie detector test." Even when he's not working, hearing about Brett's hobbies reinforces the idea he's some sort of free software samurai warrior. He hacks on personal projects like dtrx, an all-purpose archive extraction tool. He knows some Japanese and has taken a couple of long trips to Japan. Lately he's been getting into amateur radio -- he's already got a call sign (KB1WJE). Proprietary software companies love to talk about how they hire "ninjas." Well, don't worry, we've got ninjas too. Despite Brett's skills, the battle to defend freedom and the GPL is a job too big and too important to be left to a single ninja. And there is a lot more that Brett wants to do. He could take even more license violation reports head on, or publish more educational material to teach the way of the GPL ninja to a new generation. Plus Brett has racked up more vacation time than anyone I know, and he would love to take another long vacation to Japan one of these days. Brett has brought a very professional, constructive approach to working with me on the license. Without his dedication and patience the new GPL compatibility approach would not have succeeded. This year we managed to announce the acceptability of CC0 for usage with software and its compatibility with the GPL. Licensing issues are complex, and this probably couldn't have happened if we hadn't been able to take advantage of the excellent knowledge and skills of Brett Smith.